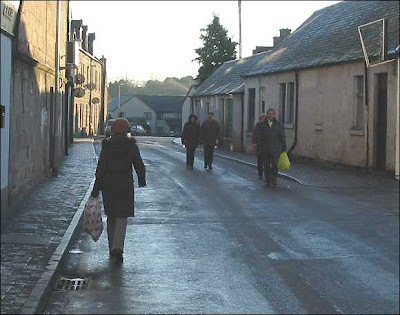 A Gurn from Nurn: Nairnites abandon the pavements in favour of the relative safety of the roads! 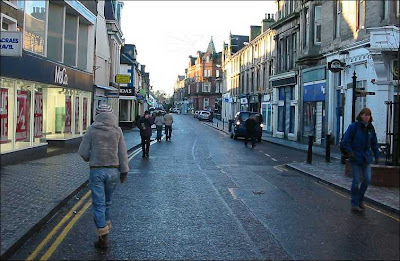 Nairnites abandon the pavements in favour of the relative safety of the roads! Happy New Year everyone! Blogging is a bit of a vice, the Gurnmeiseter was only able to stay off it for a little more than 24 hours into 2009 but citizens there is something that we must report, we have taken pictures and our conscience will not let us stay digitally silent. Has Highland Council also gone bust over the Christmas Holidays? Because there is not a bit of action up the High Street on the pavements covered with black ice and it is now 10.45 in the morning. It is usually the council’s policy to start at the town centre and work out to other areas but there seems to be a standstill today. Gurns were to be heard about why council tax is paid etc. 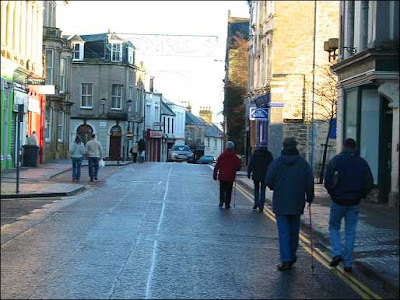 One elderly woman told the Gurn that she had walked across the town bridge on the A96 rather than use the pavement. It is quite understandable that folk will make their regular outing to the shops in the morning, comfortable in the knowledge that even if it is a bit icy where they live, at least the main pavements and the town centre will have been treated first thing. Not this time, let’s hope no one takes a serious tumble. 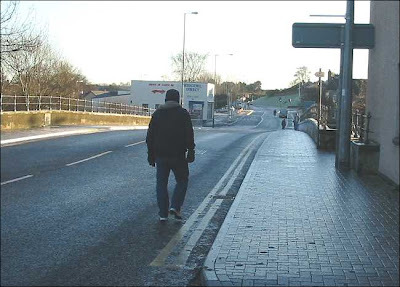 In this picture another pedestrian decides that the main road is the lesser of two evils. Customers for the hard-pressed post-woolies High Street risk injury to complete their purchases. 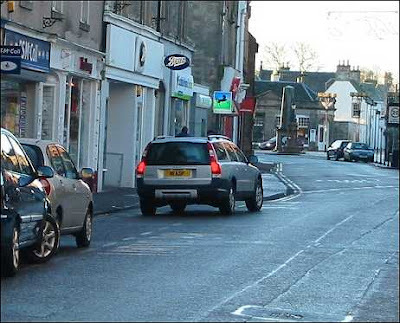 At 10.30, the Convenor mobile was seen up the High Street, surely Sandy would have noticed the punters walking on the road and the ice when he went into a shop for a paper. He headed off up the Cawdor Rd before the Gurn could reach him. Perhaps he was away up to the depot to personally take control. Happy New Year to all at the Gurn! I am reminded on seeing the photos of folk skiting around our ice bound pavements that at one time the 2nd January was seen as a public holiday in Scotland. No shops would be open and few people would be out and and about. Now we have near 24/7 shopping no matter what the time of year, and in Scotland Christmas is now seen as a pre New Year holiday. Christmas day used to be a work day for many including our posties who would deliver mail, and many shops would be open at least for the morning. We seem to have exported New Year south of the border and for many in the UK Christmas and New Year have become one long winter holiday. I am not suggesting that we return to any historic holiday pattern but happy to see that the folk responsible for Nairn pavement gritting seem to be respecting a time honored tradition! Apologies to any folk in A&E departments who this causes extra work for, still with these photos as proof we can all start the year by starting some nice legal litigation against our council for our injuries! On top of the lack of any treatment to the pavements (I've often wondered why car's get priority over pedestrians?) what about the scandal of the Council Office's being closed from 24th December to 5th January. This is a relatively new innovation but why? I can understand businesses such as building firms having a long break during the festive season but the Council is supposed to serve the people. Yes, have the statutory Bank holidays but the offices should be open for the public. OK, there is an emergency phone service but this is a public facing body. If you work there you should realise that at some time you should expect to work between Christmas and New Year, after all the Library (another Highland Council establishment) is open between Christmas and New Year, so what’s so special about the Council Offices? Another example of this bureaucratic institution forgetting why it is there? And don’t get me started on the Doctor’s surgery………..
Day two without much sign of our slippy pavements being salted in Nairn. Maybe our council could employ someone to read the Gurn so they know what's going on? Silly me... they're still on holiday! again Ice Man all relative, looks like the town centre got done this morning but what else? - hard to know unless we had a correspondent in every street. Maybe there will be some high level gurning to the Nairnshire and a fuller picture will emerge, but I suspect there was a fair bit of action today. Christmas and New year is a holiday period is it not? Are we really getting to the stage that we demand Council services every day of the year? I remember not so long ago that when the roads were covered in snow then that was how they were, at least until the thaw came, surely folks are entitiled to holidays regardless if they work for the Council? Common sense prevails surely - if it's frosty then one can expect slippery conditions underfoot - or is it the Council's fault for the winter weather conditions in winter? Rightly or wrongly we are fast becoming a 24/7 nation, witness the hours of opening which supermarkets in local towns offer. Go for a job at one of these stores and those are the range of hours you might well be expected to work. I do not wish to deny anyone their holidays but many companies who provide a service let their staff have Christmas OR New Year off. Maybe if our council want to have a blanket close down over Christmas and New Year they would like to give me a refund on my council tax for those days, or alternatively outsource services for that period. Coming to think of it why do they not just outsource for the whole of the year? "Are we really getting to the stage that we demand Council services every day of the year?" Well, yes really. We have to pay our Council Tax 365 days a year, we don't get any breaks from paying it! I don't expect every pavement to be gritted in a situation like this but I do expect, at the very least, main area's such as the town centre to be treated whether it is a holiday or not. AyeRight - Yes yet more on supermakets folks! Looking for a job in Nairn? £65,022 p.a. Ayeright asks: Is Nairn a winner or a loser? More on state funding for newspapers. Catihness.org - would it work in Nairn? Did Liz slip on frozen pavements issue? Bank and two kids to support! AyeRight is not sure which way his belt is going! Why didn't Ayeright think of that? A surprise coming to the Brae? Are Google searches trashing the planet?